#100298 - Quite simply, the best Monk's Robe we've ever offered! This may be one of the most versatile and modest garments in our collection, but the simply look shouldn't full you. The wearer would have earned the right to don such a robe through religious work and study, and was a humble mark of accomplishment. 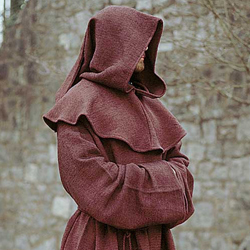 The 100%, simple cotton weave and generous cut tunic also include the hood with a long tail and the waist cord. Our single size fits most adults up to 6' tall. We recommend dry clean only. All of our costume are sturdy, theatre-quality costumes designed for repeated use. This item is usually dispatched in 5-7 business days. Actual transit time is additional.. Actual transit time is additional.